There’s no putting it off anymore. Back-to-School season is here, and the Galleria at Crystal Run welcomed it, last weekend, with its second annual #BackToSchooled event. 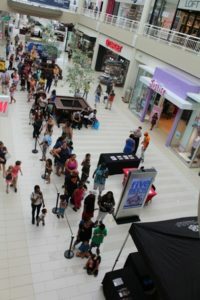 More the 200 people gathered to claim branded Galleria backpacks filled with school supplies, all while enjoying music from DJ Prime Time and Battle Entertainment, performances by the Famous B-Boy Break Dancers, and refreshments. Whether it was the sugar or the music, children were quick to join the dancers! Stores enjoyed it, too. Surrounding footwear and apparel stores saw high volumes of traffic as attendees crossed items off their back-to-school lists. Pyramid Management Group, owner of the Galleria at Crystal Run, is one of the largest, most innovative, privately-held shopping center developers in North America. Headquartered in Syracuse, New York, Pyramid’s portfolio of retail-based, tourist and entertainment destinations dominate the northeast with 17 properties located throughout New York, Massachusetts, and Virginia. Pyramid is an industry leader in combining the best elements of traditional retail with world-class dining and entertainment, all under one roof. For more information, visit www.pyramidmg.com.